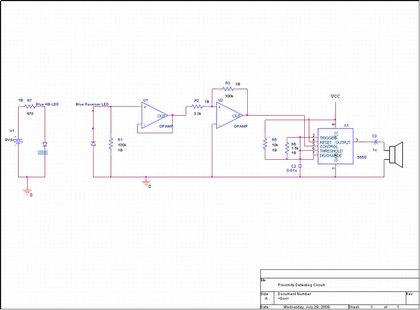 This circuit is designed to demonstrate the application of LED lighting in a sensing or security application. When no light is detected by the circuit, it will emit a sound from the speaker just outside the audible range of most humans. When blue light is detected by this circuit, the frequency associated with the sound from the output speaker falls down into the audible range for humans. The circuit can also be triggered by white light as white light is comprised of wavelengths from the visible spectrum. When a blue LED (seen on the left in the schematic) is shined at a reverse biased blue LED (part of the circuit on the right in the schematic), a small output voltage can be seen coming from the reverse biased blue LED. This voltage is then amplified through an op-amp and sent to a 555 timer to create an oscillating signal output through a speaker. Once the light is detected by the detector, the sound from the speaker falls to around 25kHz, the high end of the audible range for most people.